The Lobotomist's Dream: My One Year Anniversay: An Announcement! As I explained in detail yesterday, today is the one-year anniversary of The Lobotomist's Dream. Well, Elderly Apple is a new project I'm taking on. It's a webcomic. Well, kinda. I guess you could define it more as a web experiment, because mainly, I'm not sure exactly how it's going to turn out. Well, I guess you could also call it an experimental webcomic. But let's not get hooked on semantics. 1. You need to update on a fairly regular basis. 2. If you're doing a normal-style webcomic, you need to think of a good (enough) joke for each of those updates. 3. Not only do you need writing, but unless you're really lucky or good, you also need new artwork. 4. Not only do you always need fresh artwork, you need it for each panel of your comic. 5. You need some sort of angle. And sorry, having two room/house-mates, one bitter and cynical while the other lovable-yet-dumb, has already been done. Many, many times. 6. Seriously, you really need a new angle. Speaking in UGBA 100 (Business Communication) talk, there is too much noise in the channel. If I just do a normal three-panel comic, what will make it special? In short, the solution is to NOT make a traditional webcomic. It'd be all too much work, and unless I became infinitely better at both art and punctuality, it would be doomed for failure. If you're going to do something and have it stand out, it's got to be something completely different. It has to be a sort of niche comic that can't really be considered a derivative of anything else. So, I had that stored away in the filing cabinet in the back of my head for a while now. Then the holiday cards happened. As I explained in that post, I am known in my workplace for my weird, random drawings that doing really seem to have any point. They're pretty popular with most people. They're unique. They're occasionally funny, and...hey now! That just may work! And so, the gearwork for Elderly Apple was set into motion. I decided to use Blogger as my host, mainly because I know my way around it, and I've seen a couple other webcomics use it. So, I've been working in (mostly) secret for the past three weeks or so, setting up the site, getting the domain name, getting the feeling right, all that good stuff. And now it's ready, I feel. Elderly Apple will have a much, much different feel from TLD. While you know me here as quite garrulous, on there I will be very terse. The only commentary I will give will be in the comment section of each post (I even think I have a format nailed down). Basically, the comics are suppose to speak for themselves (which they do). And please note that even though I call them "comics" there is no traditional punchline. I guess a better word would be ideas, as that's what they are. Random ideas that you can do whatever you want with. I'm keeping the art style purposely childish. I think it fits the feel of the site as a whole (especially because my bio says "I have the mind of a demented six-year-old.") and it's also much, much easier to do than full on computer-drawn stuff (at least for now). So, every comic will be done in glorious marker and colored pencil (I bought over 50 different colors of each). 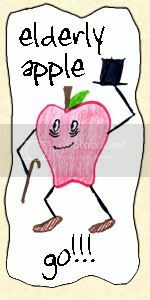 The name of the comic comes from Pliny, the Elderly Apple. 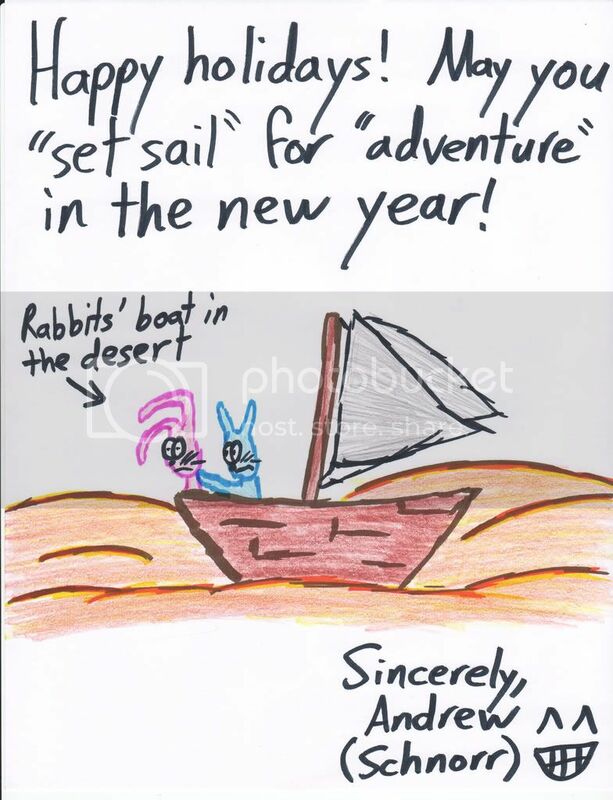 Pliny was actually a very, very close second in my favorite holiday card drawings (I couldn't help but love the pink rabbit's expression in this one) but was my favorite for a while. I also think the idea of an elderly apple sums up the feel of the comic very well. And so, Pliny is the official mascot, namesake, and first comic of the series. However, that doesn't mean he's the star. In fact, if I can keep up with the way I'm going, he'll never be seen in another comic again. As my tagline says "No plot twists. No character development. No sense whatsoever." Now, I have plans to update the comic daily. Daily. As in every day. For all I know, this may have to be reigned back to "weekdaily" but no more than that! I'm trying to commit to this experiment. Now, I know from experience that it's difficult to think of 10 or more of these random things in a day, but once a day shouldn't be too much to ask. Plus, I have my archive of the old holiday card drawings. I plan to utilize them when I seriously have nothing new to put up. They'll give me about a month of wiggle room, which I really think may come in handy in the future. So, be sure to visit the site every single day. But don't just do that. I also want you to comment. But don't just do that! I also want you to vote for me! When you look on the Elderly Apple website, you'll see a little button that says "VOTE: Top Web Comics" This is for a webcomic ranking site. It's basically there to give me more exposure. Now, when you click to vote for me, you'll be taken to a page where you'll see a little avatar with a name on it, and three buttons below. Choose the button that matches the picture. That will log your vote. Now, we provide incentives for doing this. Often its some kind of bonus drawing. I don't have the capacity for that at the moment, so I am making my incentive the most precious thing in the world: trivia! I'll find a random page on Wikipedia and then tell you some sort of tidbit about it. Fair enough, right? You can log in one vote a day, and I encourage you all to vote every single day, and make sure the votes go in. Every little bit counts! In addition to putting the comics on the website proper, I'm also going to be showing them off on deviantART (again, for more exposure) and hopefully build up some sort of following there. So check out my profile there if you want to see how that progresses. Eventually (this is if the experiment "works") I plan to profit off my creativity. I'll be selling prints of each comic, as well as the original copies of most of them. I may even go so far as to open a CafePress shop and sell t-shirts and other merchandise. Who knows, maybe someone will even give a book offer. Yes, yes, that's looking far, far into the future, but you have to think positive about these things, you know? So now I've explained pretty much everything there is to know about Elderly Apple. Mainly because there will be little serious explanation on the website proper. Just little quirks. So anyway, we'll see how this experiment progresses. But why are you still here? 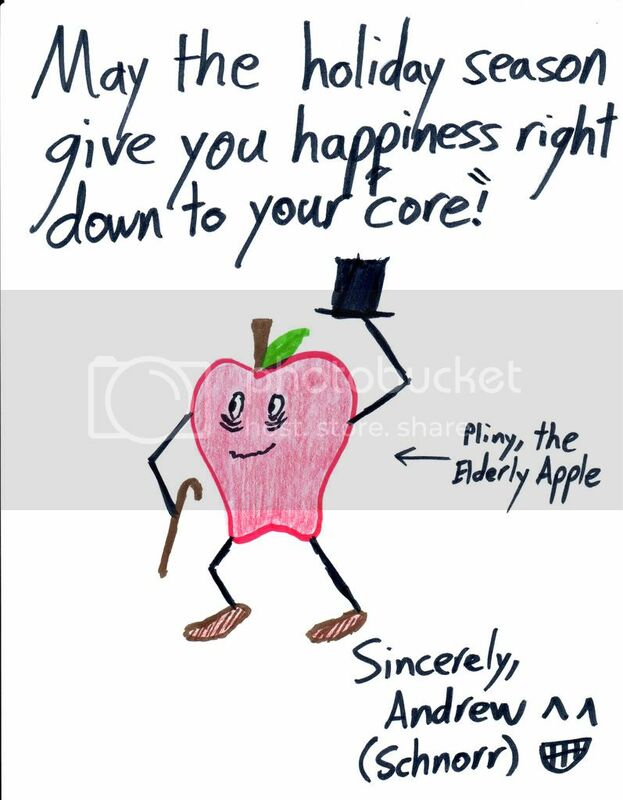 Go to Elderly Apple, and make all our dreams come true! Way to push yourself and commit. As my teacher says, the job of an artist is to "just show up" which you do consistently. You are my hero. I bow before your vision.